Fushimi Castle (伏見城, fushimijo) is a hilltop castle located in southern Kyoto Prefecture. It was built by Toyotomi Hideyoshi in 1592. 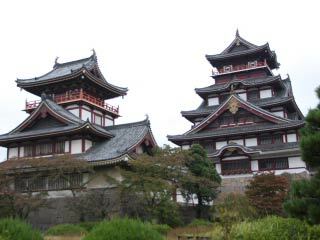 Hideyoshi built this castle for his after retirement. In 1598, Hideyoshi died at this castle. After his death, Tokugawa Ieyasu moved to this castle. During the battle of Sekigahara, Torii, samurai of Ieyasu, protected this castle. However, he was defeated by Ishida Mitsunari. It was abandoned in 1619, and many buildings are moved to Kyoto. Current Tenshu-kaku was reconstructed in 1964. It is popular Sakura spot in Kyoto. Park is open for all day, but Tenshu-kaku is closed. 1. use JR Nara Line to Momoyama. Built in: 1592 by Toyotomi Hideyoshi. Toyotomi Hideyoshi built this castle for after his retirement. The construction started in 1592 and finished in 1597. Hideyoshi died at this castle. After Hideyoshi's death, Hideyori, the son of Hideyoshi, moved to Osaka Castle, and Ieyasu moved Fushimi Castle. During the battle of Sekigahara in 1600, Torii Motodata, samurai of Ieyasu, protected this castle. However, he was defeated by Ishida Mitsunari, and the castle was burn down. Fushimi castle was reconstructed by Ieyasu in 1602, and abandoned in 1619. Most of the buildings are removed to many other castles and temples. The garden and some palaces were moved to Kodaiji and Entokuin by Nene, the wife of Hideyoshi.